Information security is, without a doubt, the most essential part of escrow service delivery. Subsequently, having security processes tested by external auditors is a must. Every professional escrow provider should – at a minimum – meet the ISO 27001 standards. Despite that all escrow providers praise the importance of information security, Escrow4all is the only escrow provider in continental Europe who is ISO 27001 accredited. In addition, the scope of the certification is not limited to a specific part or business process, but covers the entire organization and every part of the service delivery. Escrow4all is an ICANN approved Data Escrow Agent for the provision of data escrow services to Registars and gTLD Registry Operators worldwide. We ensure the secured storage of (encrypted) domain data within EU and Asia. Escrow4all is Approved Escrow Provider for the Certified for Microsoft Dynamics program (CfMD). 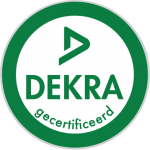 We are the only escrow provider in the Benelux who holds this status. In this capacity, we work for dozens of Microsoft partners in Europe and beyond. Escrow4all has received the FD Gazellen Awards for four consecutive years and thus belongs to the fastest growing and financially healthy companies in the Netherlands.